At a Career Crossroads? Read this First! My name is Michael Dean Thomas. I have experience in investment banks, a Big 4 audit firm and a startup. I have worked in London, Singapore and South Africa. Welcome to my blog! I see people drifting in life wherever I go. People grasping for things to cling onto in their careers. From millennials working at macdonalds, to corporate burnouts and to suicidal artists, each day human life is wasted on a global scale! I have come to a conclusion: most Christian and secular career advice simply doesn’t permanently end pointless work experiences. We are so used to secular career thinking that we have even stopped believing that drifting is abnormal. Drifting is like a recurring illness, causing us to jump from one pointless career to the next. We Need a Radical Solution to a Global Problem! When we start work, gaining money and the latest stuff satisfies our desires. But, at some stage these things become meaningless and suddenly our careers become purposeless. Something inside of us screams “this is not right!” We ignore the warning signs, and keep going because there are bills to pay. Without Even Realizing it, Our Careers Begin to Drift. I Don’t Know What Else I Can Do! We slowly become despondent if there seems no way around the career dead-end. Life seems like an endless cycle of meaningless situations. So when the first career opportunity comes along, we jump at it. Unfortunately, the Purposeless Cycle usually starts again in our new career. We start to drift, hit a dead-end and become even more despondent than before. Many people at this stage lose hope of ever finding a meaningful career and become deeply cynical about life. This is the proverbial “pig farm” experience of the prodigal son. Is There an Alternative to the Purposeless Cycle? How can someone like me, who has spent nearly two decades in secular careers decide to work with God full-time? Let me share some of the life-changing experiences I’ve had. One day I was praying and in a vision I saw Jesus standing in front of me. I heard a voice say to me “you don’t believe I rose again. Touch the holes in my hands”. In the picture I put out my hand and touched the holes in His hands. I am not only convinced that God is real, but that Jesus rose again. God’s Kingdom Dimension is Reaching Out to Work with You! God’s System of Working is Completely Different to What I Learned in Investment Banks! Why Don’t We See More Christians Working in God’s Path of Life? I was brought up in a traditional evangelical Church. We believed that God never really spoke to anyone except when they read the Bible or when they heard preaching straight out of the Bible. As a result, I spent hours reading and re-reading the Bible every week. As a teenager, I even won a national Bible quiz. In other words, Jesus is God’s living Word. This is why Hebrews 4 describes God’s Word as “alive and powerful”, made possible by simply coming “boldly to the throne of our gracious God”. Theoretical knowledge only puffs us up. It does not impress God. Not only was the over-emphasis on theology in my Church growing up misplaced, but it actually held Christians back from pursuing their God-given calling. The reality is that God always builds His Church through vibrant relationships with individuals. I come across so many Christians who believe that faith means that we simply believe that things are going to work out ok.
God created each of us to do specific types of work. When we don’t work in this way, life gets pretty meaningless! We are rapidly seeing the decline of the “evangelical movement”. This movement comes with a doomsday approach to Christianity i.e. the world is going to end soon- we might as well just focus on saving the lost. The result? Impoverished Christians who don’t know there is much, much more. I’ve attended many church services that discuss “working under an open heaven”. There is not much to do in this model, except praying for God to send His Kingdom down. Luke 8:15 (NLT) says “And the seeds that fell on the good soil represent honest, good-hearted people who hear God’s word, cling to it, and patiently produce a huge harvest.” We need to persist in “clinging onto” the messages that God has given us in order to produce fruit. In order to fulfill my own calling – which is to help people around the world work with God- I have created a few resources. I operate in the heavenly realms. If you feel led to pray with me, I will help you open your spiritual eyes and connect you to God in heaven. At the moment I am only taking appointments on Tuesday and Thursday to pray with people. The objective of the group training is for each person to bring a single product or service to market over a six month period. How does it work? I work with five people who are willing to commit over a six month period to a weekly two hour call. The idea is that each one of us contribute our individual gifts, and help each other operate together as the body of Christ. In other words, I will not be training everyone – but drawing out the gifts and talents in you so that you can create products and services of your own. By functioning together as a group, there will be real-world support and help when you don’t know what to do. If you are interested in being part of this group training – check out the next opening for submissions at my main site: www.DiscoverUp.com. If you are stuck at a career change, and prefer to work through the process on your own with God – this book may help you to find your next step in unlocking the calling God has placed on your life. The book is available on Amazon. When you subscribe to this blog, I’ll also send you a free Implementation Journal – which is the companion workbook. “This group’s mission is to help Christians go where they want to in their careers by operating together as the body of Christ. We believe that Christians who pray together often end up working together – so we have started an international prayer network. For example, if you share that you are thinking of striving for a specific goal in your career, then others in the community may share advice, offer products & services to help you move forward or some others may commit to being a mentor to you through the process. This community is about inspiring each other to move in step with God along His path of life that He guides each one of us individually along. We are actively helping each other grow in our God-given mission to change the world. – Check out this page if you’d like to find out more about God’s path of life! – Did you know that there is a war for your career? If not, take a look at this page. – If you are interested to know why business is closely connected to Christianity – take a look at this page. 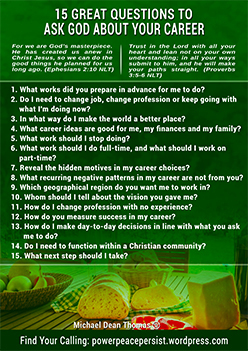 Have You Been Praying to God About Your Career?